Controversial radio show host is set to return to the airwaves. Officials tell 23ABC that McKay will take on full-time slot at KERN Radio. 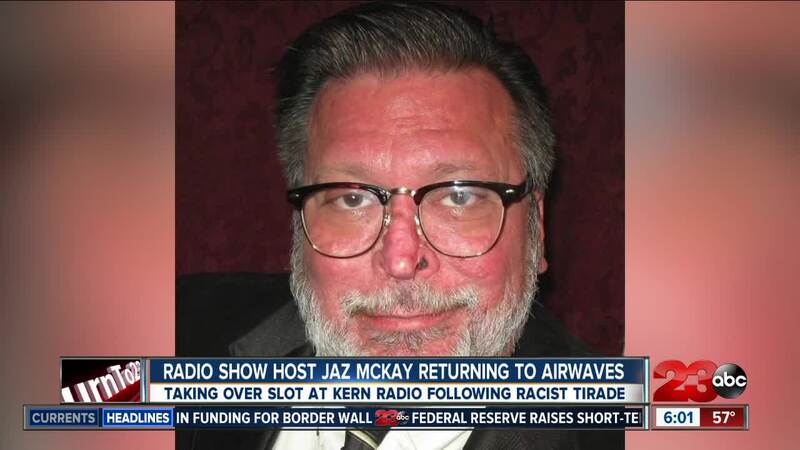 This comes nearly a year after McKay went on a racist tirade that led to him getting fired from KNZR. BAKERSFIELD, CA. — A local controversial radio show host is set to return to the airwaves. Officials with American General Media said that Jaz McKay will take over the 10 a.m. to 12:00 p.m. slot Monday through Friday at KERN Radio. This comes nearly a year after McKay was fired from KNZR for posting a Facebook live using a racial slur and insensitive language. McKay was also investigated by the Kern County Sheriff's Office in 2017 for posting a social media comment threatening gun violence. Rogers Brandon, President of AGM, said that hiring McKay was, "a careful decision that will continue to make KERN Radio a local voice of discourse and debate."